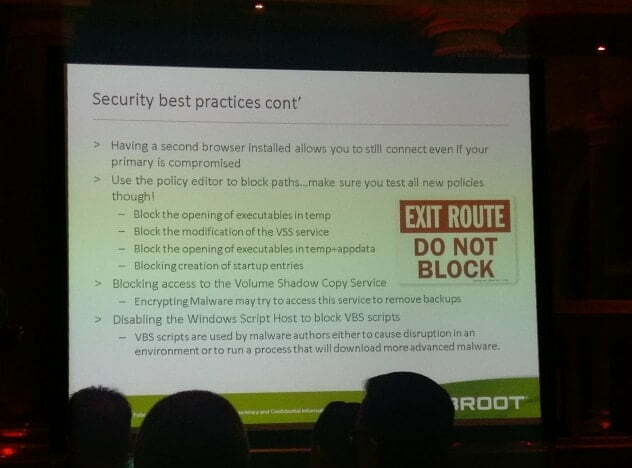 Jamie and I went up to Leeds last week to the CompTIA UK Channel Community Conference which focused on business security threats from malicious virus, malware and ransomware attacks. We learnt a heck of a lot about the past and present, how data is currently being intercepted by hackers, fraudsters, social engineering blackmailers and what we can do for our clients to reduce the impact. Ultimately, which is what we have been saying for over 10 years regardless of external filtering and anti-virus protection is BACKUP, BACKUP, BACKUP your data. With key players from the anti-virus and threat reduction industry speaking such as Webroot, Kaspersky and Security Consultants working with the MOD they all collectively said that there is not a 100% full proof protection plan. There are currently 3.5 new viruses being created every second as opposed to 1 new virus every second in 2011, 1 new virus every minute in 2006 and 1 new virus every hour in 1994. The increase is quite frankly phenomenal and scary and what’s worse is that anti-virus and malware companies simply cannot release definitions quickly enough to counteract the sheer volume of threats. Ultimately the protection and restoration of your data is solely in your (and your IT company’s) hands. A few screens from the conference are show below. We are also going to be releasing videos about security, protection and how we can help your business and employees stay as safe as possible. At the very least, we will explain how to reduce the chances of experiencing security problems whilst increasing your chances of data recovery especially from nasties such as cryptolocker, ransomware and other data compromising viruses. [divider]If you’re concerned (and you should be!) about where your business, data and infrastructure stands against external malicious security threats, Get In Touch here or call us on 0203 728 2555 and we can perform a security audit showing you where your weak spots are and how they can be filled in.